O2 is looking to capitalise on the closure of rival EE's Orange Wednesdays with a marketing stunt offering consumers who send in their Orange or EE sim cards a free pair of cinema tickets. 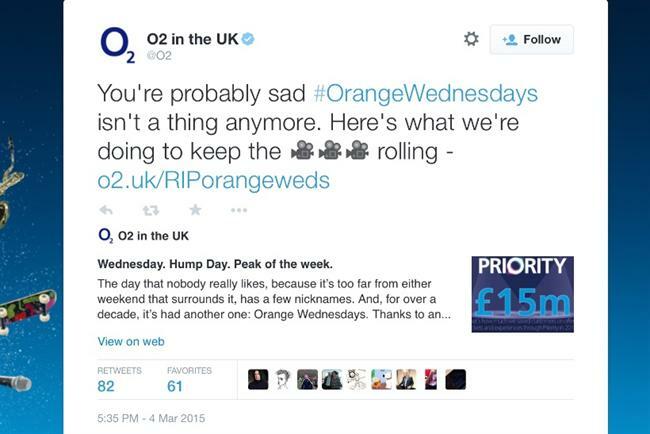 Last week, O2 tweeted, "You’re probably sad #OrangeWednesdays isn’t a thing anymore. Here’s what we’re doing to keep the [icons of film cameras] rolling. The tweet led users to an RIPorangeweds microsite that pays tribute to Orange Wednesdays, describing it as an "admittedly great marketing promotion" that predated Twitter and Facebook. The site goes on to explain that O2 has a pair of cinema tickets each for the first 200 people who send in the "special ‘Orange Wednesdays’ sim that lived in a drawer for six days of the week". Tantalisingly, O2 said it has a "little something planned for all these sim cards, so stay tuned to @O2 on Twitter". The tweet has garnered largely positive responses on Twitter, such as, "#geniusmarketing well played" from Stu Nicholson; but DazM33 pointed out that there "was no specific sim to get Orange Wednesday's all you needed to do was text to a number to get the offer". O2 replied: "@dazm33 Sorry for any confusion, we know that. We're referring to customers who just had an Orange SIM to get the tickets Daz." EE ditched Orange’s 2-for-1 cinema offer in December last year, after the promotion had enjoyed a 10-year lifespan. Orange Wednesdays was launched by Orange, before the mobile operator was merged with T-Mobile to form EE. EE has said it is planning to replace Orange Wednesdays with an entertainment promotion, but no details have yet emerged.